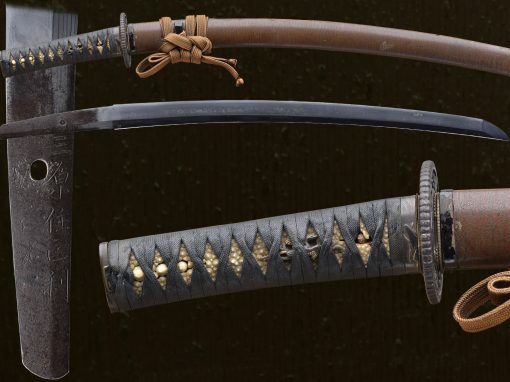 The work on this sword is very elegant. 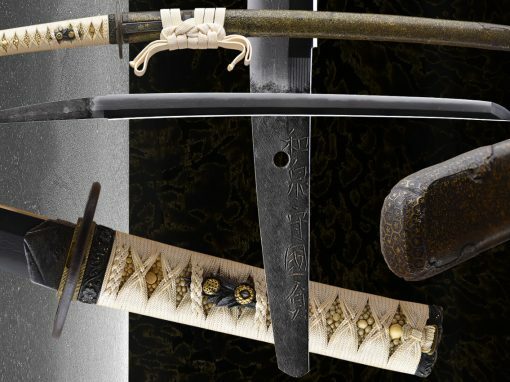 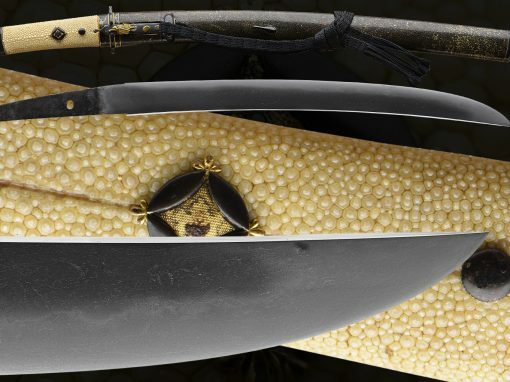 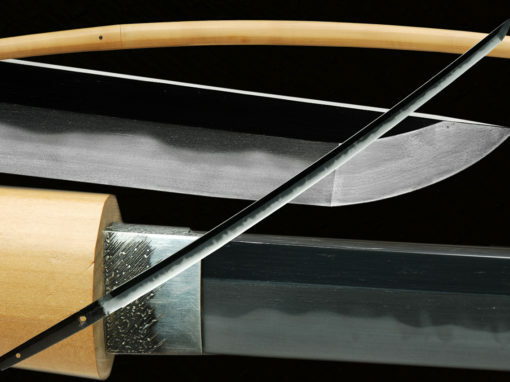 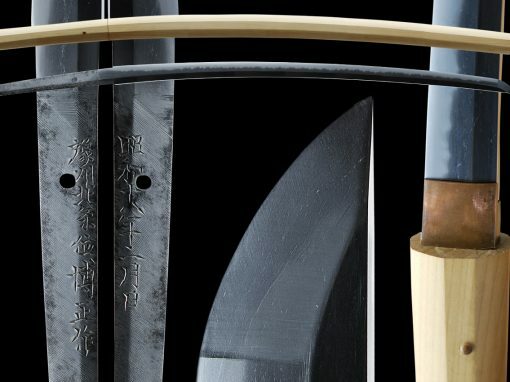 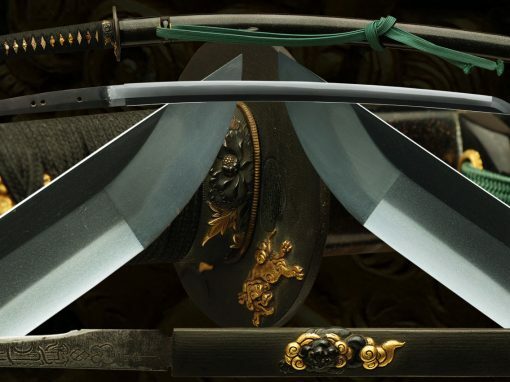 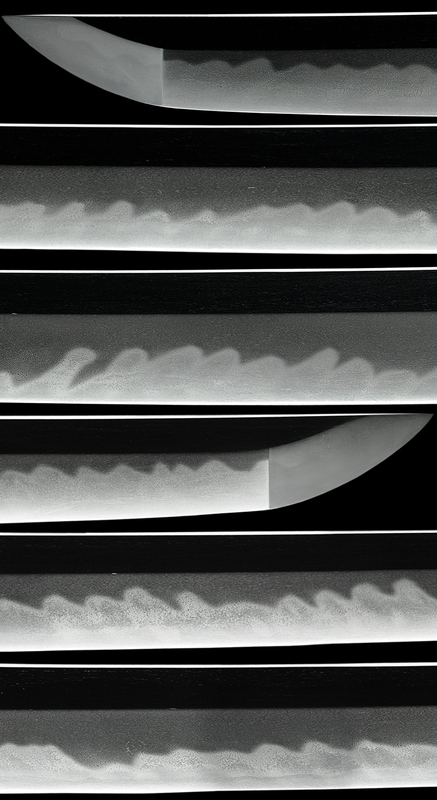 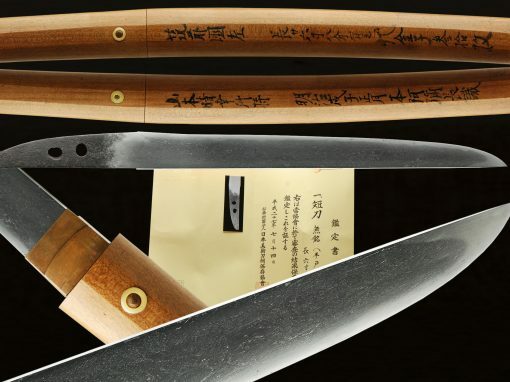 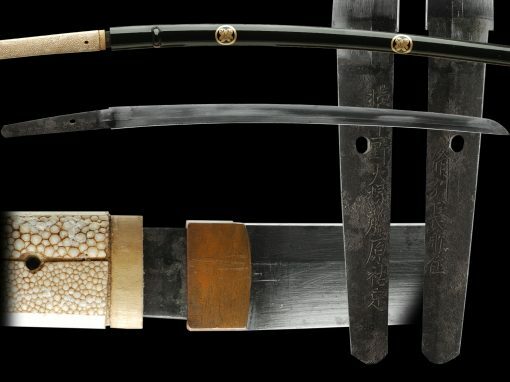 The hamon is a saka-choji with profuse nie peppering the entire surface. 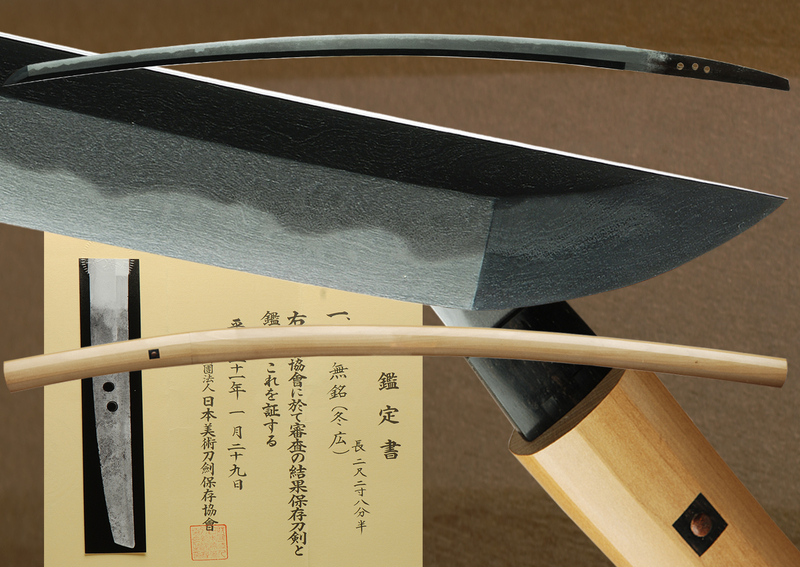 In the hamon you can see tsunagashi and kinsuji with a well defined habuchi with much ko-nie to frost the top. 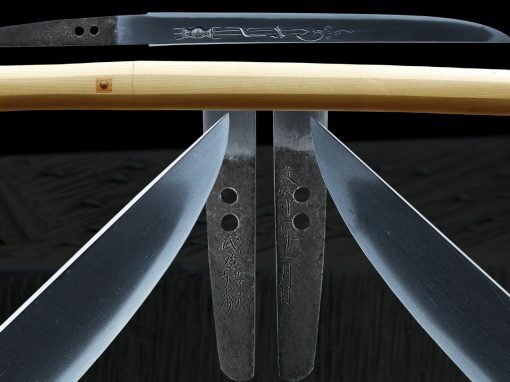 The hada is well forged and beautiful in very good shape for an older sword with longish wavy masame running here and there entwined with itame and mokume. 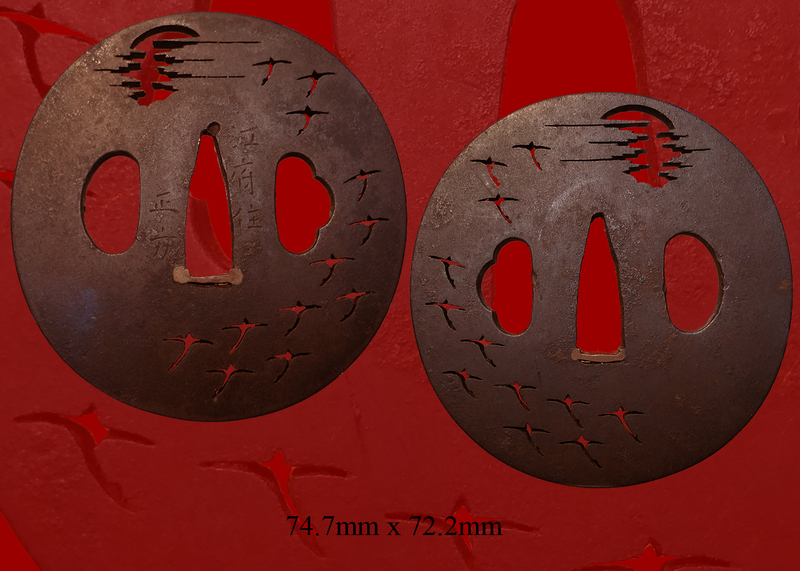 Ji-nie appears. 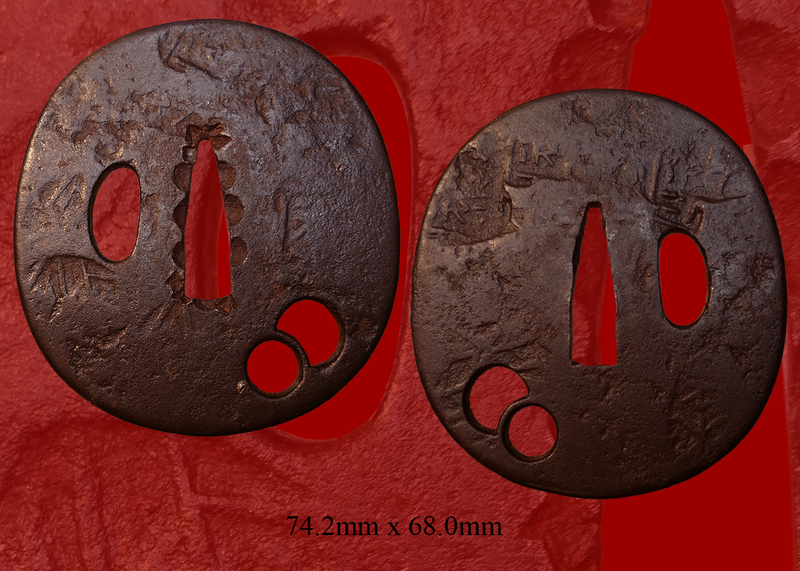 The style is that of shinogi-zukuri. 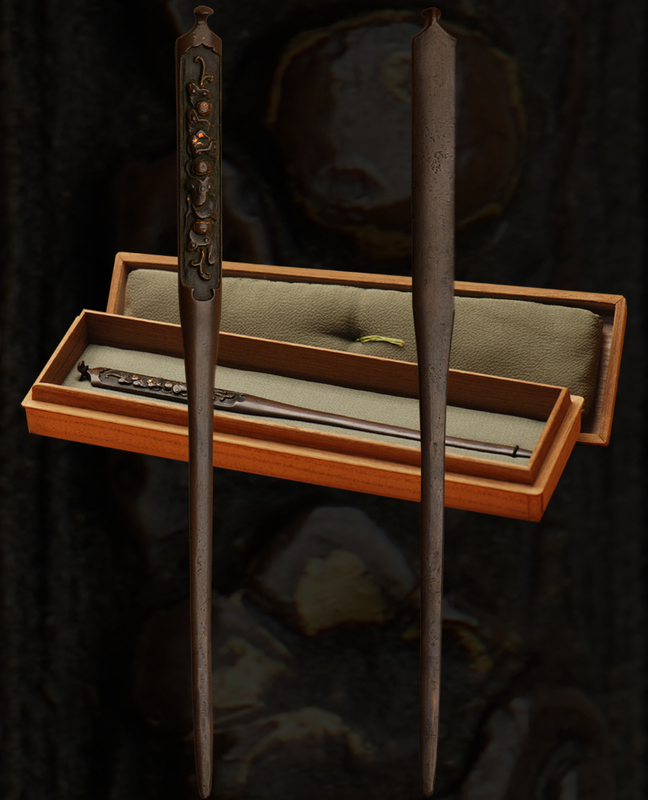 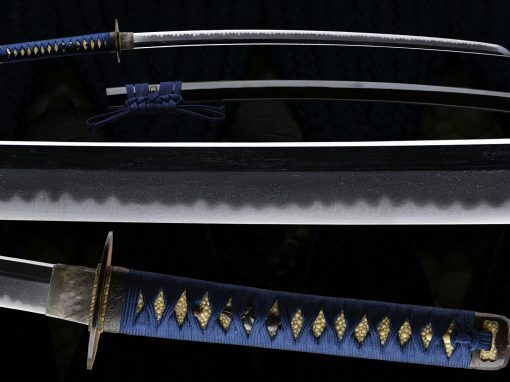 midare-komi appears in the boshi and the sword has an older feel to it. 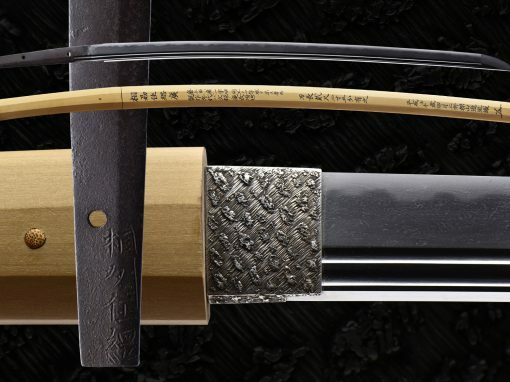 To say the sword is covered in ji-nie is an understatement. 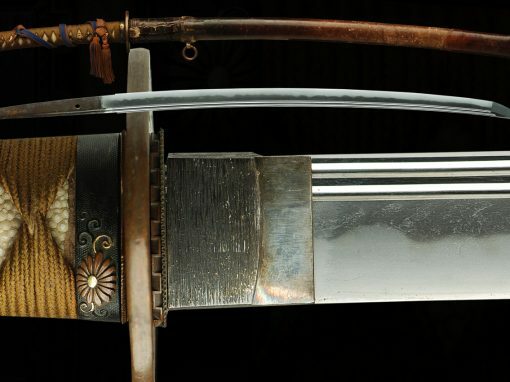 The nie is abundant on the sword. 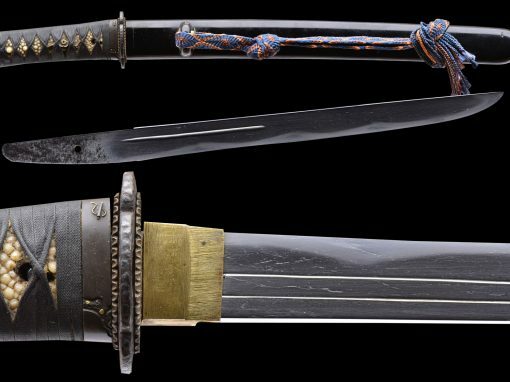 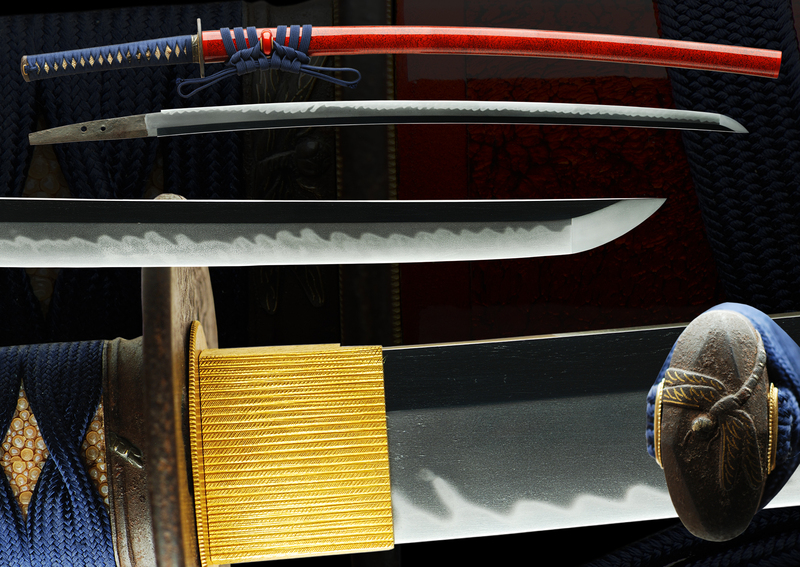 The sword has a mino school feel to it but may also be from the owari school. 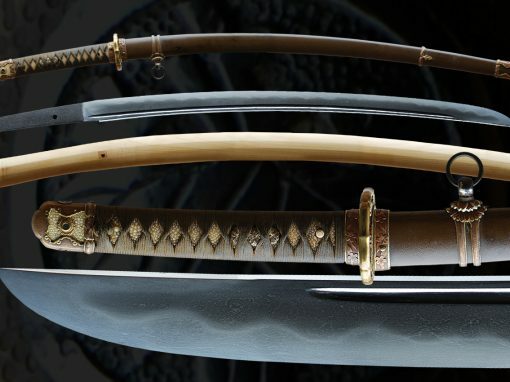 This blade should be submitted to shinsa to add more value and for an official appraisal of this sword. 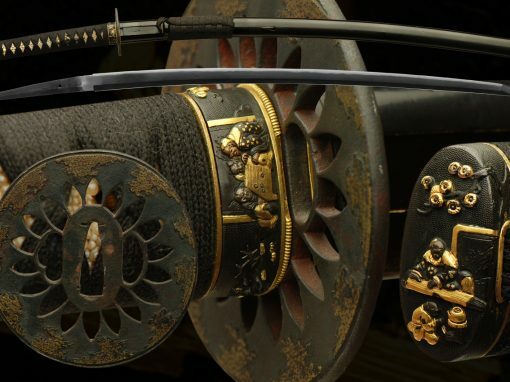 This sword is authentic and antique. 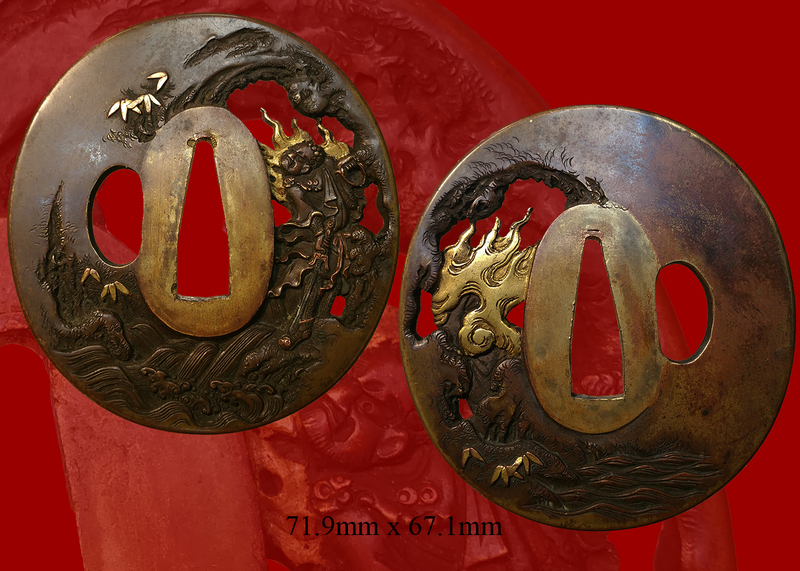 We guarantee that it will pass a shinsa if submitted. 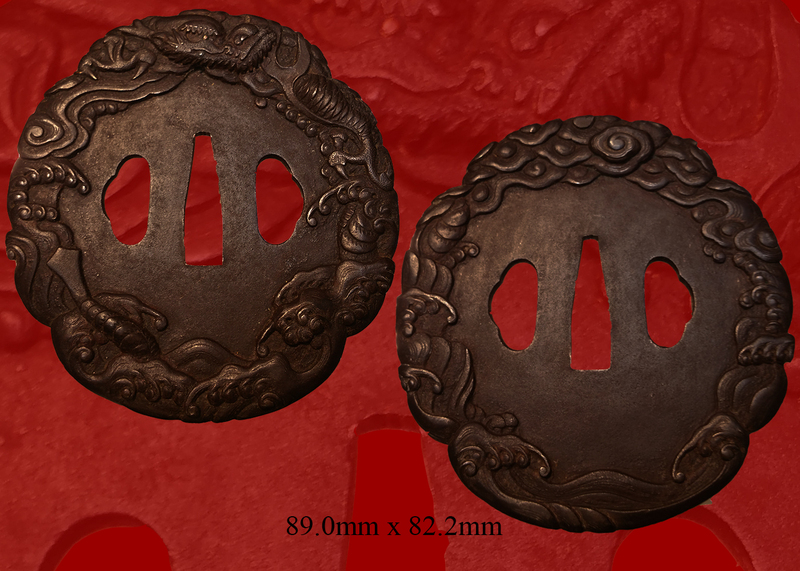 The mounts are of Dragonfly theme. 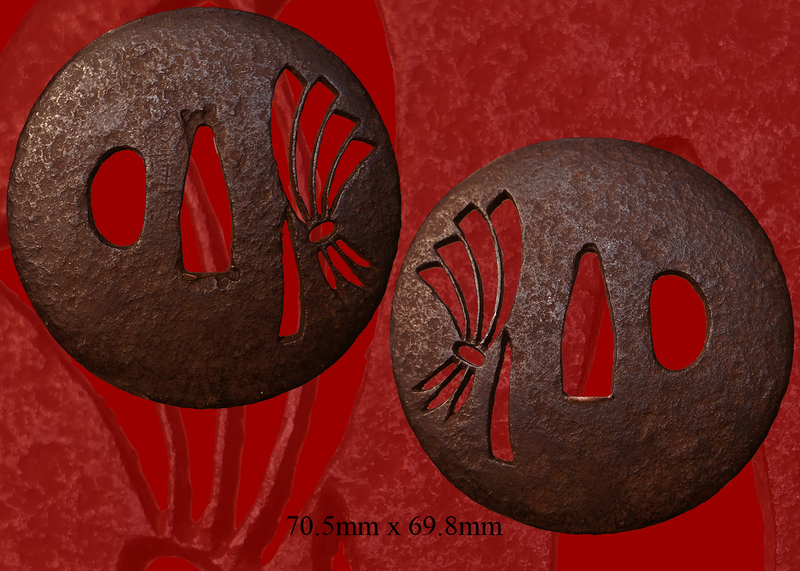 According to legend, a dead soul can take the shape of a dragonfly, especially during Bon, the Buddhist Day of the Dead. 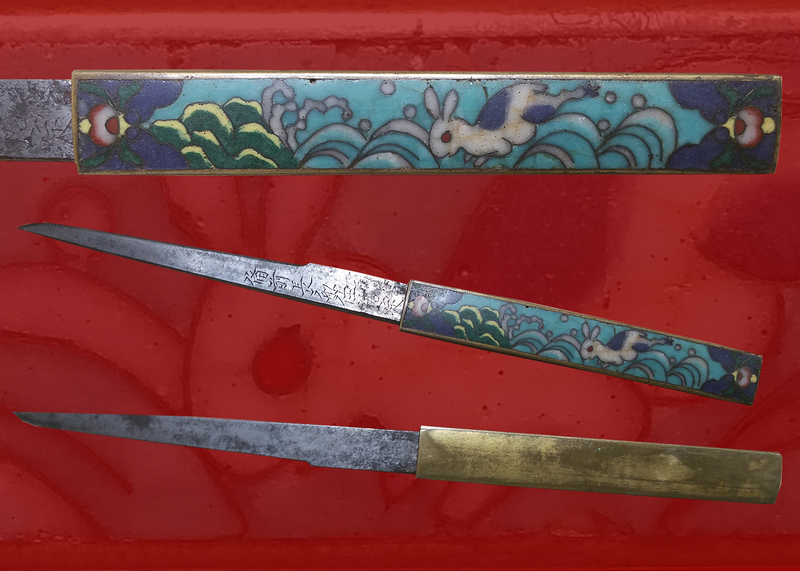 The was fully restored in red lacquer. 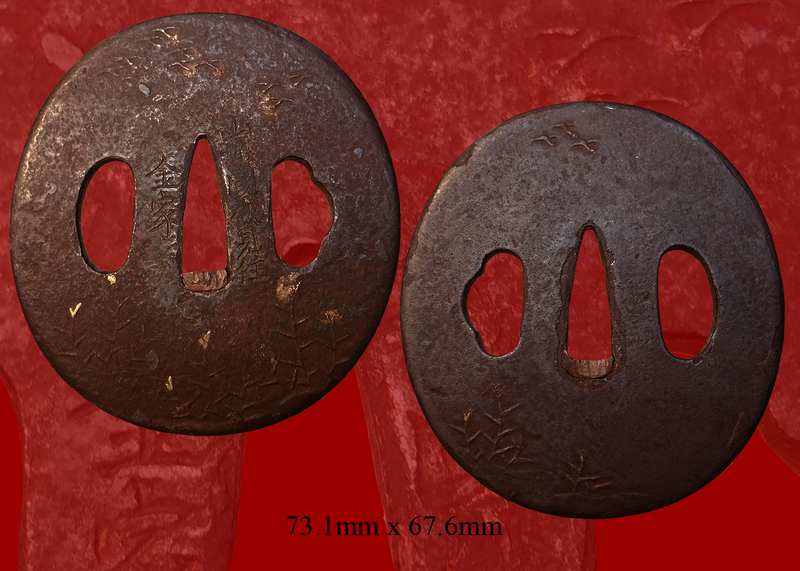 The original color was very similar and dated back over a 100 yeas. 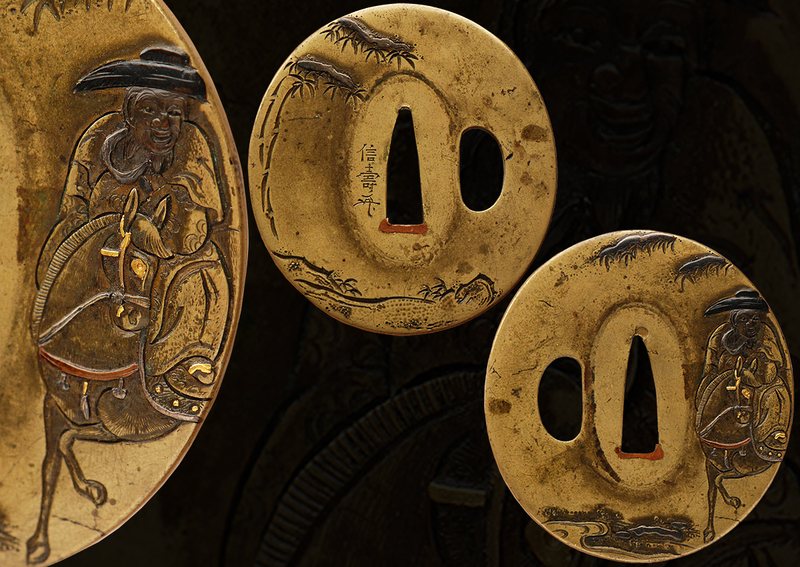 The menuki are of bees. 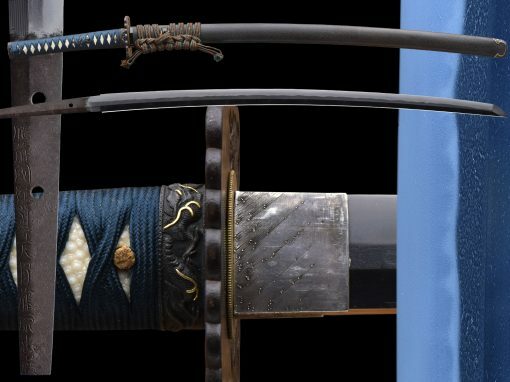 The sageo and tsuka-Ito are of a royal blue. 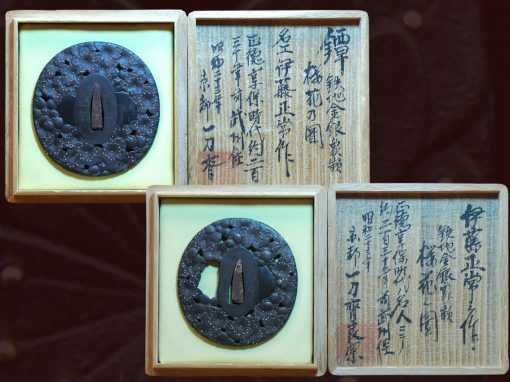 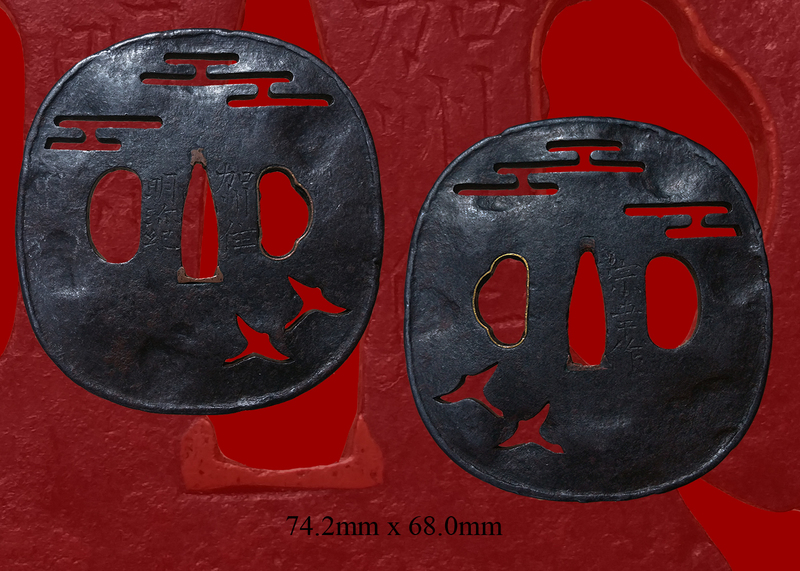 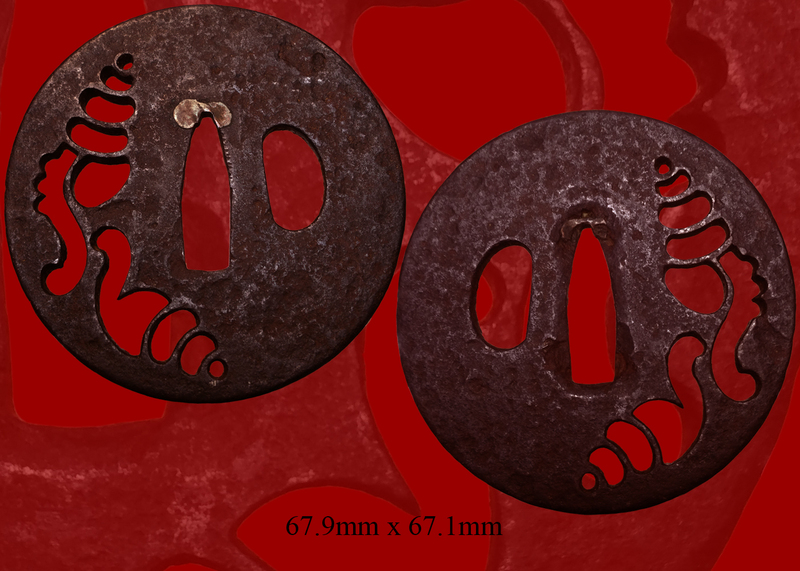 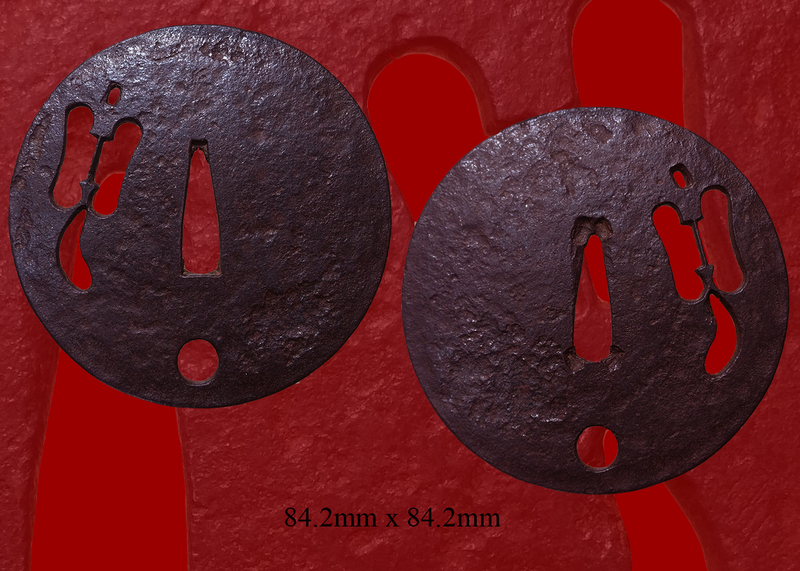 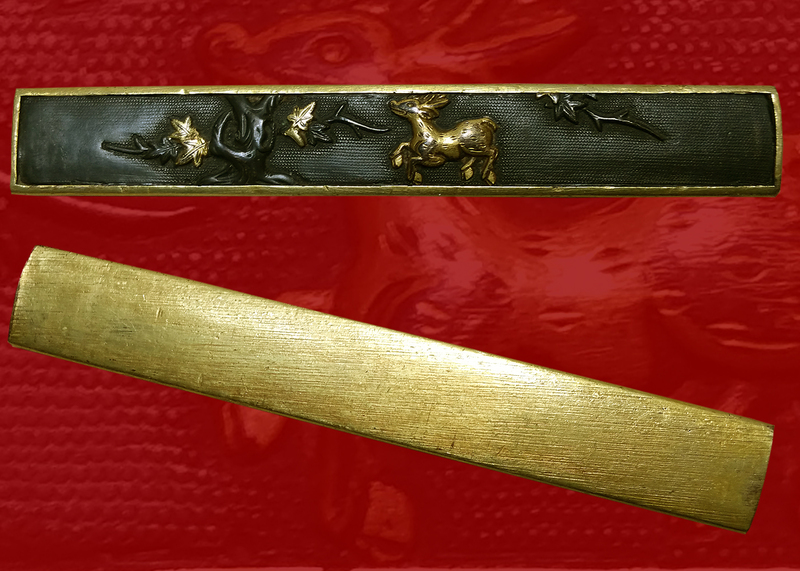 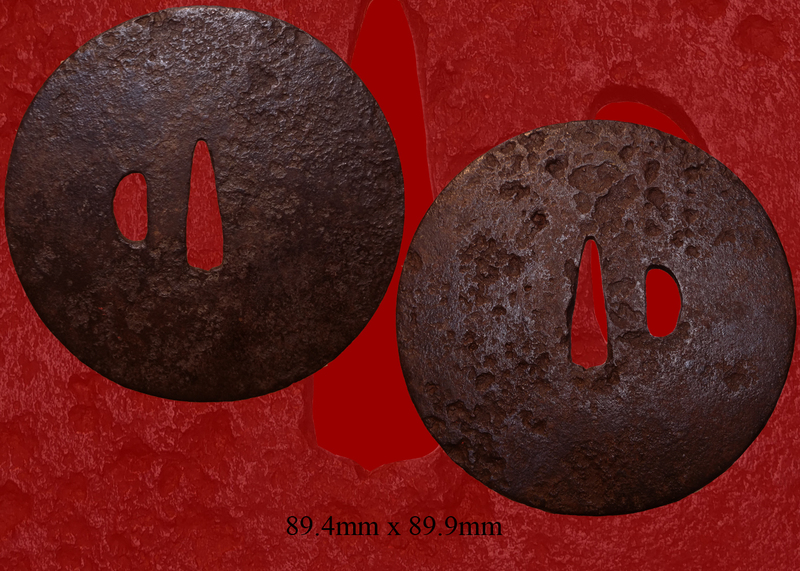 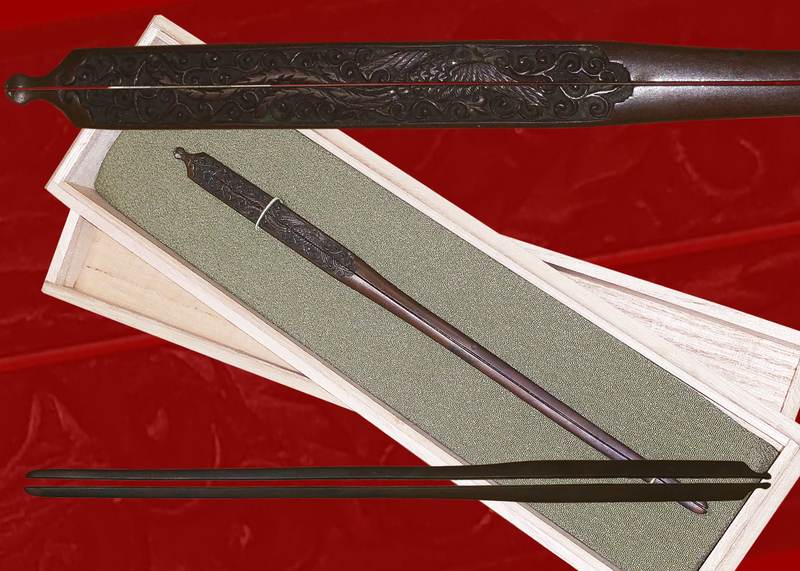 The tsuba is of iron with dragonfly motif. 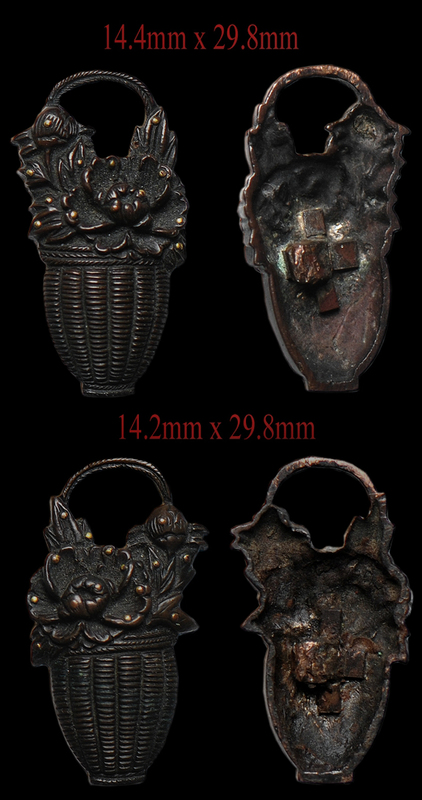 The fuchi/kashira are also dragonfly themed. 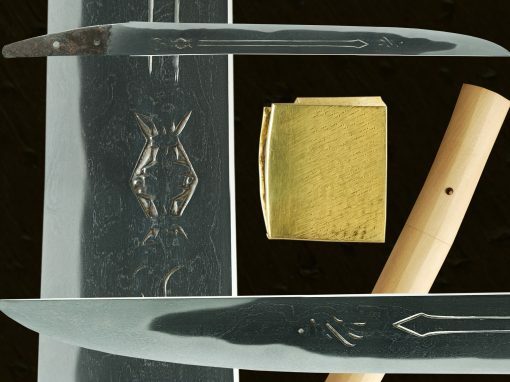 The habaki is a beautiful gold gilded and fluted in style as well as the seppa.